Prior to using avocado oil topically, you should make sure you aren’t allergic to it. To do so, place a few drops of avocado oil on your arm and rub it gently into the skin. Monitor your skin for a day or so. If you develop any negative reactions such hives or a rash, do not continue using it. If you don’t see any negative effects, you are free to begin enjoying all the benefits of avocado oil. When using the avocado for salads, instead of throwing away the peel sections, save them for your facials. The peel has a hidden reservoir of oil containing a substance called humectant that acts to retain moisture. To use the peel, gently swipe it over your skin in upward massaging motions until you have covered your whole face. For best results, leave the oil on your skin overnight, and rinse off in the morning. For a sensuous bath, you can create your own avocado oil aromatherapy blend. Mix 2 cups of avocado oil with a cup of almond oil and gently heat in a pan. Once the pan is warm, turn off the heat and add 2 bags of green tea. When the mixture has cooled, add 10 drops of lavender essential oil, 8 drops of chamomile oil, 4 drops of ylang ylang, and 2 drops of rose oil. To blend the oils well, place in an amber bottle for at least 24 hours. Add 2 ounces of this oil blend to your bathwater for a relaxing experience. After bathing, and when caring for dehydrated or rough and dry skin, a mix of avocado oil and olive oil can be used as a lotion. These two oils blend well and together help to rejuvenate the skin when they are applied regularly. For best results, apply the mix at least two times daily over the skin. To give a nice fragrance to the mixture, you can add a few drops of any essential oil such as jasmine, orange or lavender. Avocado oil can be used for head massages. It also can be used as a hot oil treatment for the hair, as avocado oil can actually be absorbed by dry hair shafts. To make the treatment, put 2 tablespoons each of avocado oil and castor oil in a bowl, and warm it up. Once the hair is wetted, massage this warm oil into the scalp and leave overnight. Shampoo the hair and scalp in the morning. Regular use of avocado hot oil scalp treatment makes the hair soft and can help eradicate dandruff. Avocado oil can be used to make a facial masks for skin treatments. Peel 1 avocado in a bowl, mash the fruit into a paste. Mix in 1 teaspoon of avocado oil. Wash your face with warm water to remove the skin oils and any dirt. Avoid the eyes, nose and mouth, spread the mix evenly over your entire face using a spatula. For the oil to penetrate deeply into your skin, allow the mask to remain in place for at least 10 to 15 minutes. To remove the mask, use a towel that has been soaked in hot water and the excess water wrung out. With the towel placed over your face, apply pressure onto your face and then downward to remove the avocado. Because avocado oil tends to reduce itching and inflammation of the skin, people who suffer from very dry skin or from eczema often find avocado oil to have soothing properties. To treat dry skin or eczema, pour a small amount onto the affected skin areas. Avocado oil is rich in a type of steroid called sterolin. Sterolins can penetrate deeply into the skin to afford it moisture. To make use of the power of sterolins in treating age spots, mix 2 tablespoons of avocado oil with and equal amount of castor oil, and stir well. Massage well over the age spots, and let sit for at least 15 minutes. Follow this with a warm water rinse. Eating avocados confers numerous health benefits. 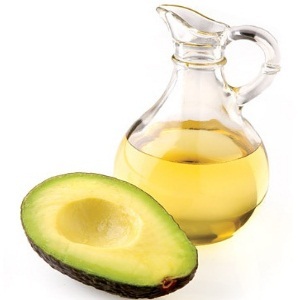 Although the nutritional value of avocado oil is similar to that of olive oil, avocado oil is lighter and lacks the bitter taste of olive oil. Because of this, it is a good choice for salad dressings or for use as a condiment. It is also a healthy alternative. Research has shown that when added to salads, both fresh avocado and avocado oil facilitate the absorption of carotenoid antioxidants. Furthermore, consuming avocados is good for your heart, and helps to regulate blood sugar levels. The antioxidants in avocados help in preventing cancer. Eating salads containing avocados or avocado oil with all their good vitamins and nutrients provides your skin with long-term benefits. In other words, whether you apply avocado oil topically or eat it as a salad dressing, either way, it will do wonders for your skin. In order to get oil with the best health benefits, look to buy avocado oil that is unrefined and organic. A 16 oz. bottle of unrefined avocado oil from a health store typically sells for about $30. Blends of avocado oil containing garlic and/or olive oil can have good culinary uses.